Miss Print: Jelly Roll Jam + a Giveaway!! My favourite Jelly roll would have to be Barcelona. YUMMY! I think my favorite jelly roll right now is Barcelona. I promise I'm not taking the easy way out -- Lush Uptown is my favorite and I want to win this! Thanks! I follow you via Feedly, thank you!! I really want a Baby Jane roll! Been eyeing that one for a while. So many gorgeous jelly rolls to choose from! For me, my favorite is a toss up between S'more Love and Wrens & Friends. I follow you with GFC, beautiful quilt! I really like Hope Chest by Edyta Sitar. with the summer wrapping up... I'm liking s'more love for a jelly roll right now. Love Sunnyside by Kate Spain! You had me at Lush Uptown. I LOVE this line! Hooty Hoot Returns looks like a great choice to make baby quilts from this pattern! It's my favorite for today. it's not out yet, but i'm totally digging wallflowers! I just started following on bloglovin. I love Scrumptious and Lush Uptown! Thank you so much for the chance! Sunny side is one of my favorites. I think playing with the Ombre simply Color jelly roll could be fun for this pattern. Of course, I just worked with a charm pack of Bluebird Park and that fabric is super adorable. Road 15 is my favourite right now, but I'm being quite tempted by Barcelona. That is one sweet baby quilt pattern... I love it!! My favorite jelly roll is Bobbins and Bits! Thanks for the chance!! I follow your blog via Bloglovin' - thanks for another chance! Bobbins and Bits is my favorite. Thanks for the chance to win. I do so like Barcelona. Thanks. I follow with blogger. Weird, I can't add any new blogs but I still have all the old ones. I think you quilt is great. 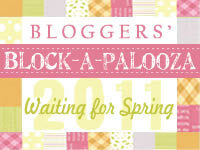 Probably my favorite of the blog hop. Thanks. I'm kind of liking that Boho jelly roll! Lushtown is my new favorite. I'm definitely throwing my name in the hat for this one! The lush uptown is my fave! pb&j is my fave jelly roll. Thanks for the chance! Florence Jelly Roll is my favorite. 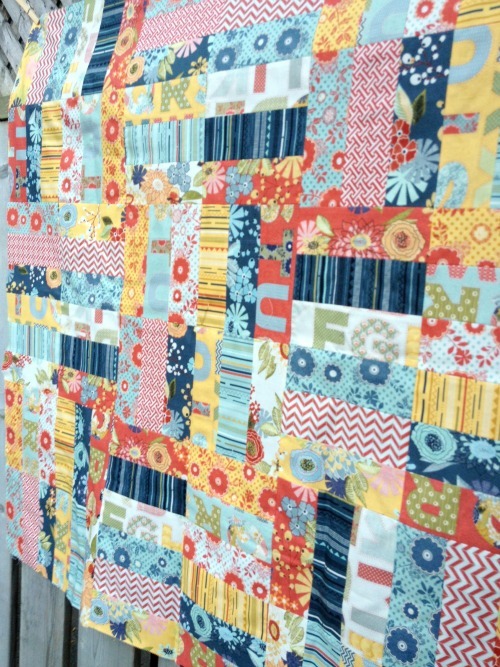 My favorite jelly roll at the Fat Quarter Shop is Sweet Serenade by Basic Grey. I love the colors in Barcelona! It really looks like all the tiles I saw when I visited there! Can't wait to try this quilt! My favorite jelly roll at FQS is Barcelona, by Zen Chic. Thanks for the chance! I'm a new blog follower. Thanks for the chance! I love the Josephine jelly roll. Such pretty colors. And I follow your blog through Blog Lovin'. I think Jubilee by Bunny Hill might be my favorite. Flats by Angela Yosten for Moda is my favorite jellyroll. Thanks for the giveaway. 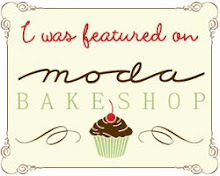 (Urban Chiks for Moda Fabrics). Scrumptious is my favorite jelly roll at FQS. I love your PB&J quilt. Thanks for the chance to win. I follow your blog via email. Thanks for the opportunity to win a jelly roll! 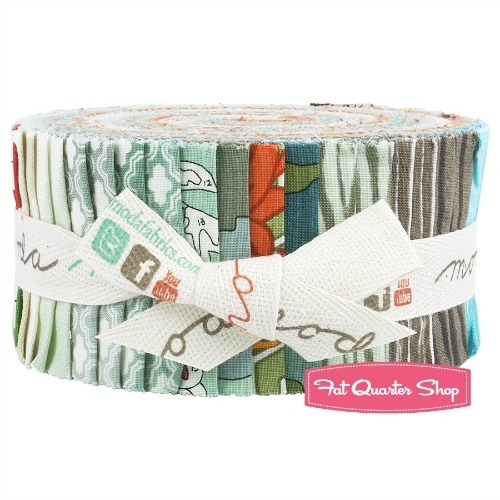 I love the Baby Jane jelly roll in the Fat Quarter Shop. Ashbury Heights, haven't had a chance to get any of that one yet. I'm a follower via Bloglovin'. This quilt looks great in PB&J. I've been perusing the blogs that have made one, and it is amazing how the different fabric ranges changes the look of a very simple pattern! I'd love to snag some Simply Style in a jelly roll. Great basic colors. Thanks for the chance. I love Odds & Ends! My favorite jelly Roll is Baby Jane, it would make a beautiful quilt from this pattern. Hard to choose, but I can't go past Sunnyside! Thats a tough one! There are so many gorgeous lines out right now! I guess if I have to narrow it down I'd say it's between Baby Jane and Road15! Thanks for the chance to win! I like the Josephine jelly roll. Thanks for sharing. I especially like the bit about it being an easy pattern to follow. I love Sunnyside by Kate Spain!!! I am already a follower! (Through Bloglovin'). I follow you on Bloglovin! Thanks for a great giveaway. I love blue bird park! My favorite is Apple Jack Cotton Jelly Roll by Tim and Beck. Love the colors. I am a follower of your blog via Blog Lovin'! If I have to pick only one, then I'd say Apple Jack cotton. My grandson would love it. Thanks for the give away. I follow on FB, bloglovin and email. Thanks for the generous giveaway. I like Bobbins and Bits! I know some Christmas babies who'll be getting a Christmas jelly roll jam! Besides Lush Uptown, I love Barcelona! I follow in goggle dashboard and on facebook! Never made a Jelly Roll Quilt before or even used one, although using the stripes would probably work well with the QAYG technique as well. A collection I currently have my eyes on is Sweet Serenade by Basic Grey. So that would be my fave jelly roll as well. Since I'm a sucker for repo's I would have to say Kimberly's Garden would be my Jelly roll choice. I have been following you via Bloglovin. Thank you for the great giveaway Kaye. My favorite jelly at the moment would have to be Scrumptious! I love Aspen Frost. The colours are great, the prints are cute and it satisfies my mood for all things Christmassy once the first yellow leaves appear on the trees. My favourite is a Rolie Polie - Too Cute to Spook!! I love this one but I also love Enchant. I follow you using Feedly. I love reading your posts. Thanks! Ive been oogling Lush Uptown, so this is a very timely giveaway! Thanks for the chance! My favorite jelly roll is Barcelona - just love it. This one is my favorite! I also like Simply Style and the Florence design rolls. My top fav is PB&J ! It's been on my wish list for ages now. Thanks for the chance! I'm your avid follower on Bloglovin. I love the PB&J roll. Thanks for the chance to win. I've never made a Christmas quilt so Aspen Frost is my choice. 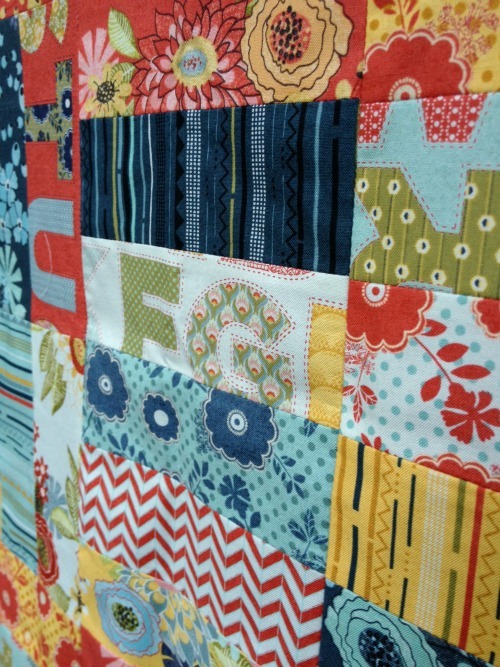 I think I'd like to make this quilt with the Giggles jelly roll by Me and My Sister for Moda and I think I'll order it while it is on sale for 20% off! I'm a new follower of you blog! Love the Road 15. Really want some of that line. Thanks for the chance. I'm really loving "giggles"! Thanks for the giveaway! I would LOVE the Bluebird Park jelly roll! So many to love! Barcelona and Sunnyside are two front runners but I really like Ashbury Heights too. I think that Apple Jack jelly roll would make an adorable quilt with this pattern! Thanks for the opportunity to win! EASY - "Nature's Christmas" by Sandy Gervais! Lots of stitching to do before the Season arrives...and this quick Jelly Roll Jam pattern helps me get ahead! Lush Uptown would be my favorite right now, I'm making a pillow project for a hunting friend with the line! I am a follower of your blog too, thank you for the giveaway! This couldn't have come at a better time. Just found out my niece is expecting twins, one jelly roll,two quits! Just over at FQS, I have my eye on Blue bird park jelly roll. I think I see hedge hogs, adorable! I am new follower of your blog! There is no way on earth that I could possible pick only one favourite, lol! You ask too much! I want to make my daughter a quilt for Christmas. Her bedroom is mostly blacks and whites so I love the Licorice Bali Pop...It would be perfect for the pattern I have in mind. I really like the last line by Amy Butler. But its a tough choice! I like the Heather Bailey True Colors Design Roll. HI! "SUNNYSIDE" IS MY FAVORITE! I like the jelly roll they used in the tutorial- Serendipity. I also like Lush. I am a follower! That is how I found your giveaway! BTW i follow by GFC! Honeysweet jelly roll is really pretty! It was hard to choose since they had a huge collection! Your quilt is lovely - adding this to my wish list to make. My favorite jelly roll is Road 15. Licorice bali pop is one of my favorites. Thanks for a great pattern, fun fun fun...please add my name to the draw. I love the Sunnyside jelly roll. My favorite jelly roll is Baby Jane! 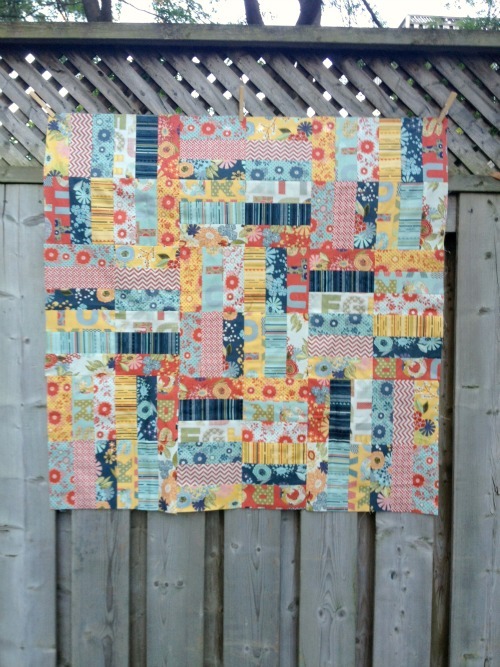 Simply Style is my favorite Jelly roll right now.Thanks for a chance to win. I love Happy Go Lucky. I think the colors in this would be so cute in this pattern. I'm torn between Honeysweet, Bluebird Park, or Road 15. All three are on my list of collection must-haves! I love the Bobbins and Bits line. I follow your blog, that's how I know about this cool give-away. Thanks! Boho Chic and Baby Jane are my favorites. Thanks for the chance! Scrumptious is my favorite right now, unfortunately, Fat Quarter Shop doesn't carry the jelly roll precut. My second favorite is ZenChic's Barcelona. And, I signed up to follow your blog just now. Thank you for the chance to win. My favorite at this moment (it changes hourly) is Eclectic Elements.